John Quantrell is alleged to have attacked Christopher Willett on Mansfield Road and Sinclair Road in Torry on September 11 last year by smashing windows in a car he was in and later speeding towards him in a vehicle and hitting him. 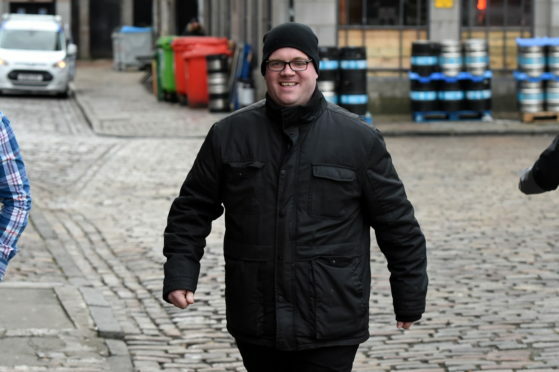 Yesterday the High Court in Aberdeen heard from Mr Willett, 36, who claimed he went into “survival instinct” and thought he would die if he didn’t act urgently. He told the court that he had been in a relationship with Mr Quantrell’s daughter between December 2004 and September 2015 but that their parting was acrimonious and her family had never liked him. Advocate depute Eric Robertson asked him what happened as he left his workplace of Trojan Crates in Torry on the day in question with colleague Jason Steele. He said: “As we went into the car there was a bang against his car. “The person on their passenger side came round across to the passenger side window. “I thought ‘what is going on’, I thought it was some sort of road rage. He then claimed the glass was smashed with a hatchet and the man swung four blows with the weapon against his head, chest, legs and arms. Mr Willetts added: “It became survival instinct and I thought to myself if you stay here you are dead. “I thought get your feet out of the window, better they get hit than the head, neck or throat. He claimed that after removing his assailant’s hood and scarf he realised it was Quantrell. Following this he claimed the next thing he could remember was waking up in the street and being treated by paramedics. Representing Quantrell, of Regensburg Court in Aberdeen, defence counsel David Moggach questioned his version of events. Mr Moggach then suggested the gaps in his memory including not knowing how he got out of the car were implausible. Quantrell, 65, denies the charge against him. The trial, before Lord Clark, continues.